WHEN: Thurs. May, 12th 11:00 a.m. sharp! Thorough background checks on all gun sales. 40% of guns are currently being acquired without background checks. 90% of South Carolinians support this change! Extending the waiting period from 3 to 28 days for completion of background checks that are red-flagged for further investigation. To close the loophole that allowed the Emanuel AME killer to purchase a gun. Creating more effective penalties for those who violate gun-sale and gun-possession laws. Current penalties are a mere wrist slap no matter how many repeat offenses. HOW: We'll rally at the State House in Columbia to link hands and turn tragedy into action. On Tuesday, May 12th at 11:00, we’ll . . .
Bring 3 Friends or Family Members: SC lawmakers need to see that SC wants change! Arrange for transportation to Columbia via car pools and church vans now. Wear Our Passion: We’ll wear a white t-shirt over our dress shirts, writing the words “Two Die in SC Every Day” on the back with a thick marker, and the bold-face name of an SC gun victim on the front. Wear the name of a victim you know, or of an Emanuel AME victim. Don’t forget to bring hats, water and suntan lotion! Link Hands Around the State House: In Charleston last June, we linked arms across the bridge. Now South Carolinians link hands around the State House. Without impeding anyone’s ability to enter, we’ll peacefully demonstrate our unity and determination to save lives. Bring Signs Naming Our Congregation and the Urgency of Change: “Background Checks Now!”, “Close the Loopholes!” or “Let's Stop Gun Violence! Speak Our Truth: Relatives of gun victims will have the opportunity to announce the name, age and town of their lost loved one, and five words or less that capture his or her personality. Visit Your Legislators: Call your legislators now to set up appointments on May 12th from 9 -11 or after the rally -- and please show up knowing their names even if you don't make an appointment. Go to www.scstatehouse.gov/legislatorssearch.php, type in your address and click on the names of your State Senator and State Rep to access their phone numbers. < > Here's a flyer to print, hang around town, and share with friends. For more information visit www.projectunityusa.org. A group of funeral Homes that were concerned about murders in communities across the midlands came together to launch this impressive show of force against the continued crime and acts of violence. A hearse processional was launched in Chicago after the rash of murders committed by our own black brothers and sister of the community. It shocked the entire community in to a realization of the finalization of death. 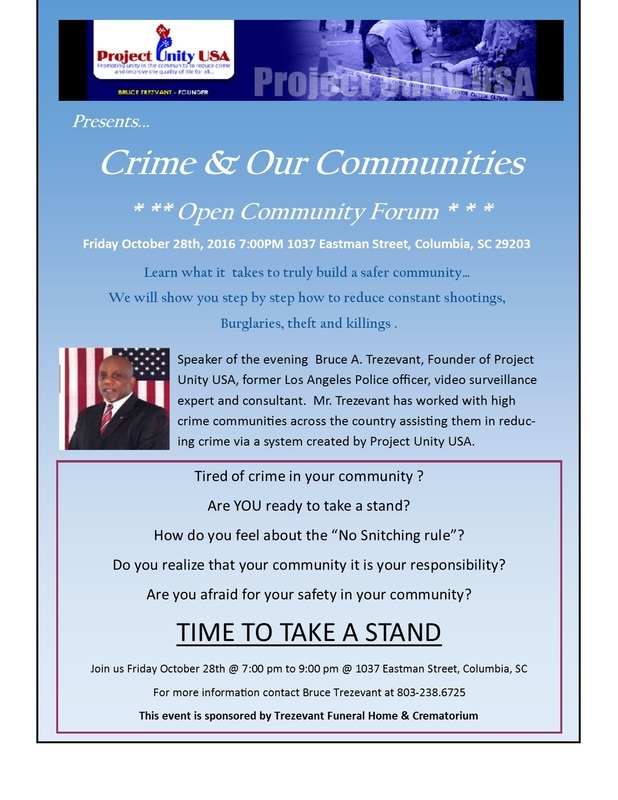 We will be joined by Richland County Coroners Office, SC Highway Patrol, Columbia City Police and a host of other concerned organizations. Join us as Mr. Bruce A. Trezevant (our Founder) and his high school friend tell about their journey to a Kidney transplant and great gospel music from three of the Midlands top gospel groups. This will be an event full of tears, laughter and awareness of the need for organ donation in the black community. 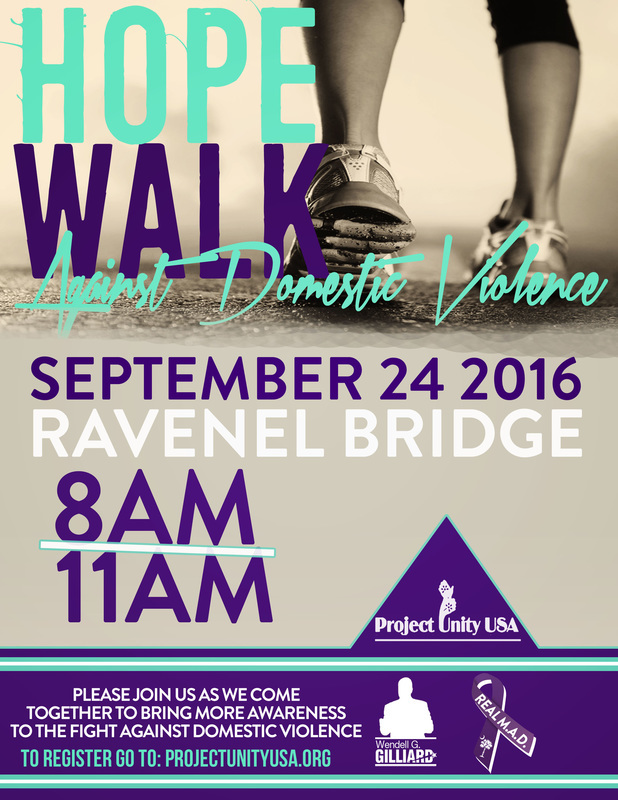 We will be joined by The National Kidney Foundation, Donate Life south Carolina, Life Point and several other organizations.